As one of the biggest events in the entertainment industry, last night The Academy Awards was chalk-full of memorable moments. From Neil Patrick Harris' top-secret, lock proofed predictions to a handful of unexpected winners, the 2015 Oscars was all about the shock factor. But when it comes to the most surprising (and buzz worthy) moments last night, Lady Gaga definitely takes the crown. Social media was going crazy after she took the stage for her incredible Sound of Music medley. She showed us that just when you think she's done all she can do, she has another trick up her sleeve, or should we say red glove? Seriously, from her recent engagement to this, we wouldn't be surprised if she pulled a Beyonce and released a new album next week! This special performance definitely showed us a new side of the talented Lady Gaga we know and love. Rather than her usual raw and edgy performance, Lady Gaga proved that sometimes, simplicity is key by donning an elegant white dress and flowing hair. And don’t even get me started on that voice. Who knew Lady Gaga could do classical? As a big Sound of Music fan, I can definitely say I gained a whole new respect for her after this. I’m pretty sure a lot of viewers did. The performance concluded with a well-deserved standing ovation and a surprise visit from the legend herself, Julie Andrews. As we replay the moment over and over in our heads, here are a few of my favorite—GIFs from the most memorable moment of the 2015 Oscars. I was like a little child gazing at the TV. I love this movie SO much! For this special moment I was so ready for Julie Andrews and Christopher Plummer to unite on stage, but then they were like, "Lady Gaga." Huh? My frustration faded away when Gaga hit that incredible first note and soon I was back to twirling on mountaintops. When she made that transition from "The Hills Are Alive" to "My Favorite Things" I thought she was getting ready to go Gaga on us, but then I realized it was a medley and I was like, "bring it on!" When she finished the final note, she knew she had killed it. And so did everyone else in the audience. Cuckoo! Who is that peeping from behind the curtains? Is it a bird? No, it's Julie Andrews! Excuse me, while I fangirl uncontrollably. What better praise than from Julie Andrews herself? 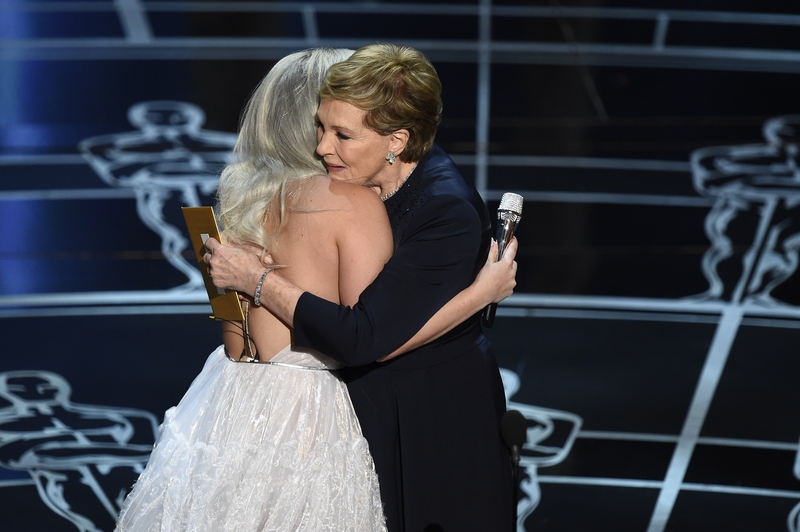 Seriously, when she pulled Lady Gaga into her arms and whispered in her ear to congratulate her? Ahh, the emotions!